October 22, the “Relay-Hope” torch arrived at the Cancer Survivor Club of Shanghai after being relayed through Colorectal Cancer Month of May, Lung Cancer of June, Gastric Cancer Month of July, Breast Cancer Month of August and Lymphoma Cancer of September. The Cauldron which symbolized hope of cancer related persons was ignited in the by Prof. LEI Zhenglong, head of Chronic Disease Department for Disease Control and Prevention Bureau for Ministry of Public Health, Prof. ZHANG Guangchao, General Secretary of CACA, Mr. YUAN Zhengping, Director of Cancer Survivor Club of Shanghai, and Mr. WANG Xinguang, a manager of Roche Co. Ltd. etc. 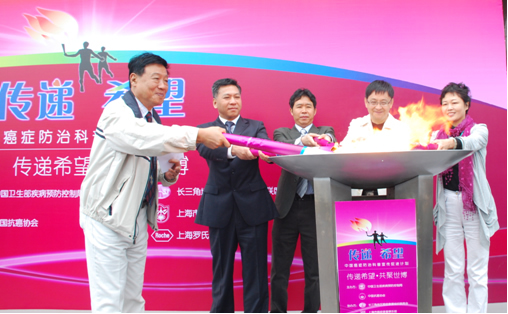 The lightening-up of the cauldron means the closing of “Relay-Hope: The promotion of Public Education Project for Cancer Prevention of Control in China”. This exciting moment was witnessed by around 200 cancer survivors and over 30 mainstream media including newspapers, journals, website, radio station and TV stations. Prof. Lei mentioned in his speech that “2008 Dialogue-Hope”, “2009 Hand-in-Hand-Hope” and “2010 Relay-Hope” as the themes of “The promotion of Public Education Project for Cancer Prevention of Control in China”, a comprehensive public education project, dispelled some of misunderstandings on cancer and changed public attitude towards and action to cancer. This project is credited to the joint effort of authorities, experts, mass media and cancer patients, and influenced several hundred thousands of people. The screening of lung cancer, liver cancer, gastric cancer, colorectal cancer, breast cancer, lymphoma cancer, etc was carried out in the key areas that ministry of public health were focusing. Meanwhile, club for survivors were set up in some of the center cities, such as Beijing, Tianjin, etc..
Prof. Zhang summarized the key work of “Relay-Hope”: to disseminate academic knowledge and information, to provide professional medical service to and to promote oncology development to the western and remote area. He mentioned in his speech that the life quality and survival rate of patients with cancer were relatively improved. Mr. Yuan, on behalf of patients with cancer, thanked the relative organizations that provide hope and light for cancer related persons for they providing a suggestion on returning to normal life. Humanist medicine as a new conception was embodied in “Relay-Hope” which also met the trend of harmonious society. Mr. Wang said in his speech that his firm had long been an active volunteer for fighting against cancer in China. As an enterprise with strong sense of social responsibility, Roche would cooperate together with all round of society in detecting new and more effective measures of anti-cancer work.